PuzzleMad: A Chomine and Pelikan Triumph is Coming Soon! For those of you who follow me on Facebook you will have seen that I received a few packages over the last 10 days or so. The first set I showed off on my New additions page. Jakub and Jaroslav have been very busy in their "New Pelikan Workshop" and are in the midst of a production run of wonderful new puzzles from Stéphane Chomine, Osanori Yamamoto and Lucie Pauwels. Jakub has given me the opportunity to buy the set in advance to have a play with and write a review - let me say that you will not be disappointed with these as they are fabulous. 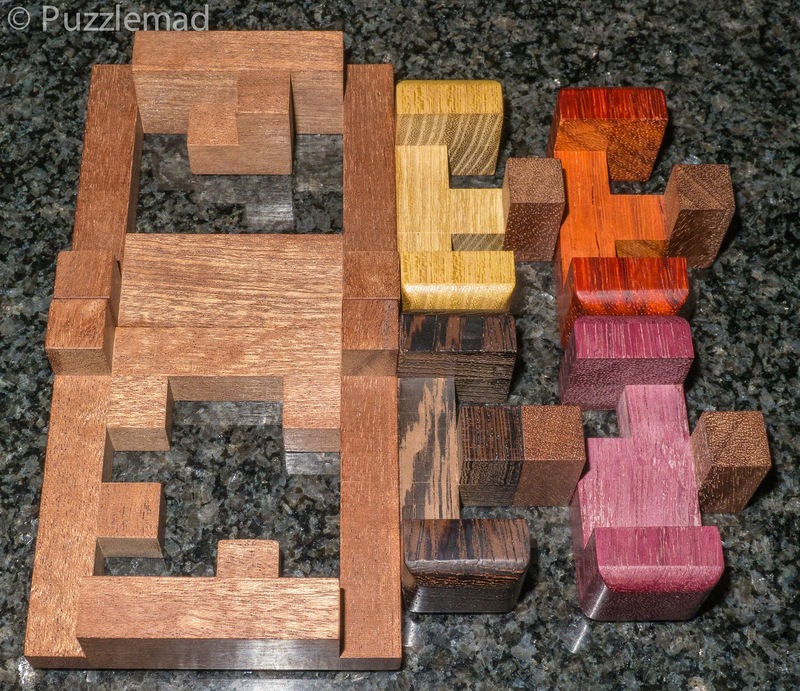 Today's post is a review of the first 4 of these puzzles. Stéphane seldom puts his new designs on Ishino's site now and so it is always a fantastic surprise when some new designs get released to the world. When Jakub told me about them I jumped at the chance to buy - very occasionally I have said no to one of his puzzles and have always regretted it afterwards (yes I should have bought the How?Box designed by Peter Hajek and fabulously implemented by Pelikan but I turned it down as I don't collect boxes to allow someone else the opportunity to own it - damn that was a stupid thing to do!) This time I didn't hesitate and said yes yes yes to the lot! When they arrived Mrs S showed the rather huge cardboard box to me and tapped her feet in disgust - "where are you going to put these?" That is a very good question as my study is now absolutely choc-a-block with new toys and I have nowhere to put them just now. The packing puzzle will just have to get a bit tighter! 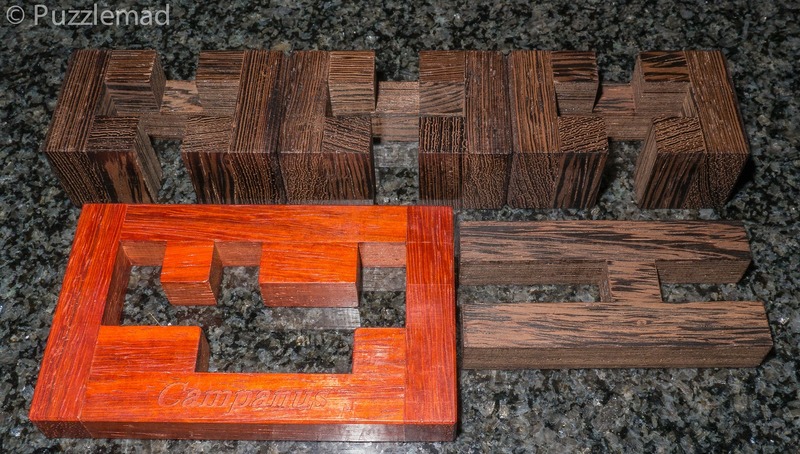 I'm going to start off with the Sucrier burr puzzle (it is the 4th one I tried but is the easiest of them). It looks like a straightforward burr with 4 sticks in a square ring frame but there is a hidden delight which you discover early on during your exploration. 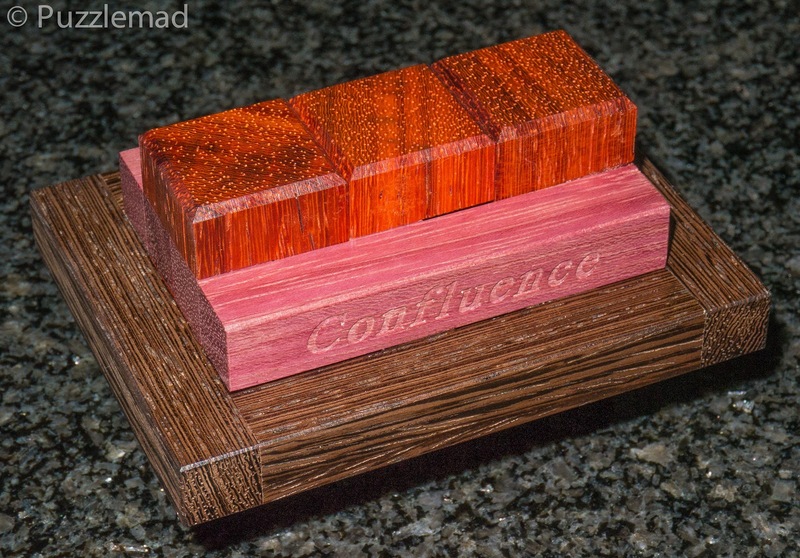 It is stunning with burr sticks made of Wenge, Padauk, Purpleheart and Acacia with what looks like a Mahogany frame. The first thing that jumped out at me apart from the colour was the delightful rounding of edges rather than standard bevels. 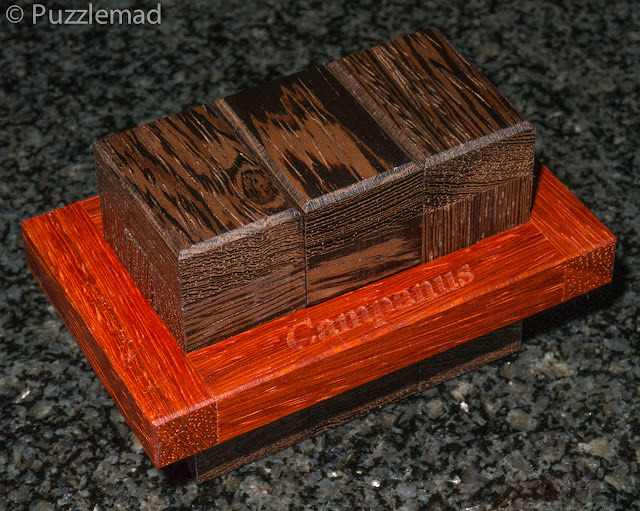 It makes the puzzle really tactile - a wonderful thing to hold and play with. The burr sticks have protrusions! I am not particularly good at burr reassembly and after scrambling the pieces and leaving them a while I would usually expect to have to resort to Burrtools for a reassembly however this puzzle is just so logical that reassembly is just as much fun as the disassembly. Despite being one of the easier burr puzzles that I have bought recently, Sucrier is actually one of the most fun to play with - nothing is hidden and the exploration is wonderful! Can you see why there is just a single level of 21? Again, this puzzle is not difficult but it has a fabulous sequence and a couple of lovely Aha! moments during the solve. 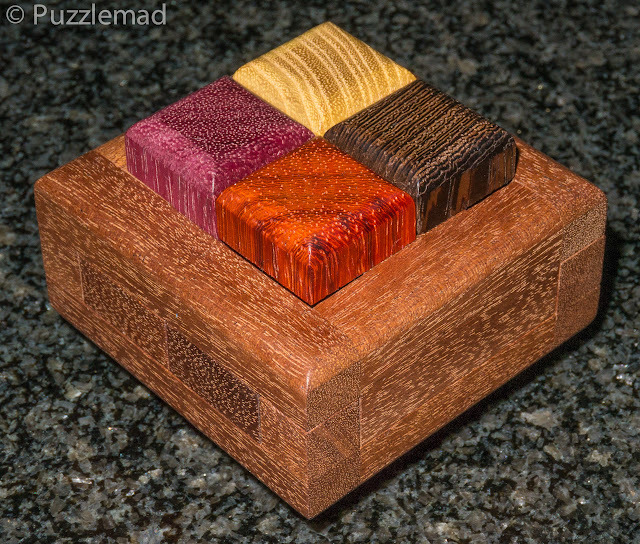 It is perfect for someone new to burrs as well as seasoned puzzles (like me). 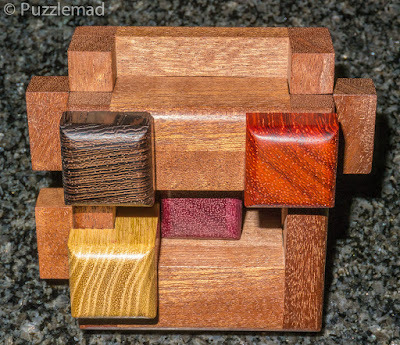 It also is another puzzle that is perfect as an assembly puzzle - scrambling the pieces and attempting reassembly is pure logic and can easily be worked out from scratch. So if you want to do a "Laurie" then this would be a good one - get a friend to disassemble it and see if you can just put it together. When this one came apart, 2 pieces fell on the head of the cat who was fast asleep on my lap. He got a fright and shot off spilling the puzzle on the floor (also reminding me that I need to clip his claws again - OUCH!) 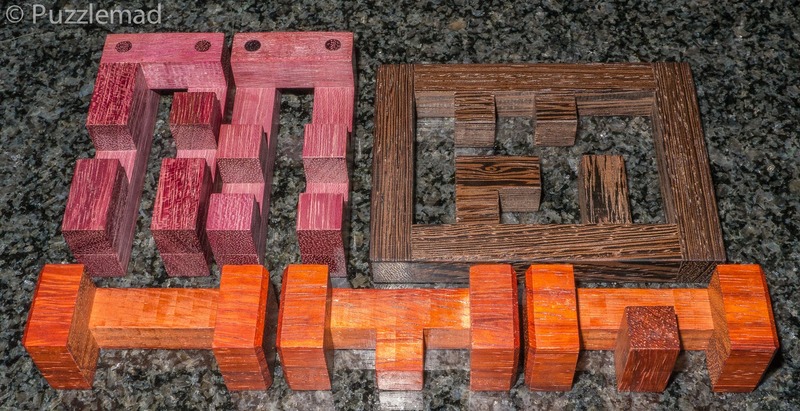 I scrambled about and picked the pieces up and of course couldn't remember where they had come from or the starting orientation. As you can see they are very similar. It would seem to be a theme with this release of puzzles that the reassembly is just as much fun and just as good a challenge as the disassembly. It took me the whole of the rest of the evening to work it through but it can definitely be done with a litth thought, exploration and a little memory. It looks so simple in the design but is actually a wonderful challenge due to the hidden nature of a couple of moves. I absolutely adore this puzzle - there is just so much to explore and so many unexpected moves. The reassembly had to be done first with Burrtools. 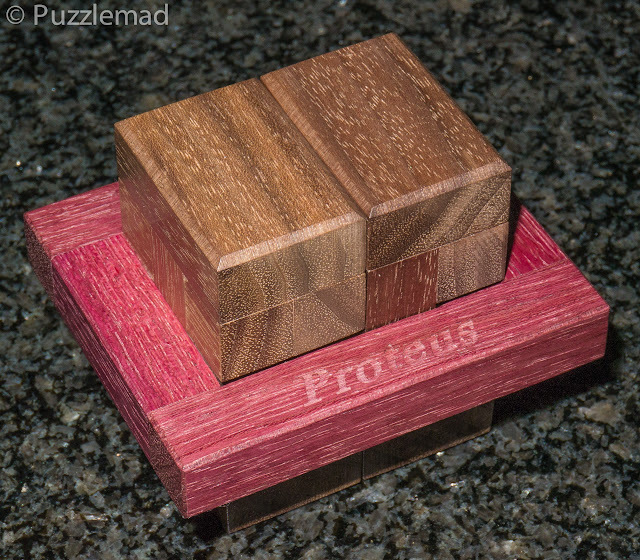 The second and third attempt at this puzzle has shown it to have plenty of repeatability. There are quite a lot of moves which I just cannot seem to remember and it remains a challenge even though I know where the hidden position should be. The second time I even managed to reassemble it without Burrtools and that really made my puzzling day. All 4 of these are wonderful in their own right. My favourite is Confluence but the others are great fun and well worth buying. Jakub will be updating his site soon with all of these for your delectation and delight. What else did I receive in this bountiful puzzling week? 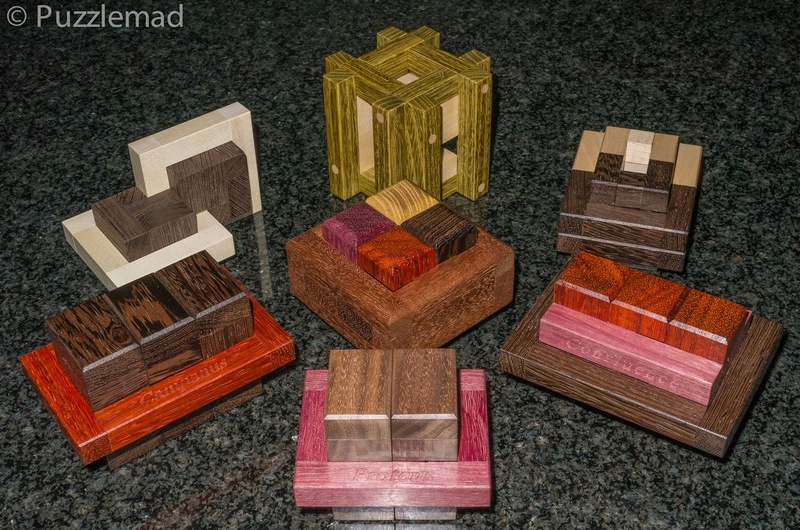 I'm not ready to blog about them yet but after Mike's fabulous guest post for me last week, I could not resist going to Tomas Linden's Sloyd.fi store to buy some more puzzles including the fabulous goodies that Mike reviewed. Of course, I couldn't just buy 2 or 3 wire puzzles I had to buy a good few and Tomas was kind enough to send me a couple of gifts too. Have a look at my New Additions page to see what I bought and go have a look through the site - there are loads and loads of disentanglement puzzles at all levels to play with. I also received a copy of Shane's latest torture device which he has named "Laurie's puzzle" - Allard reviewed it here and I will wait a while for my review so as not to bore you with the same puzzle.